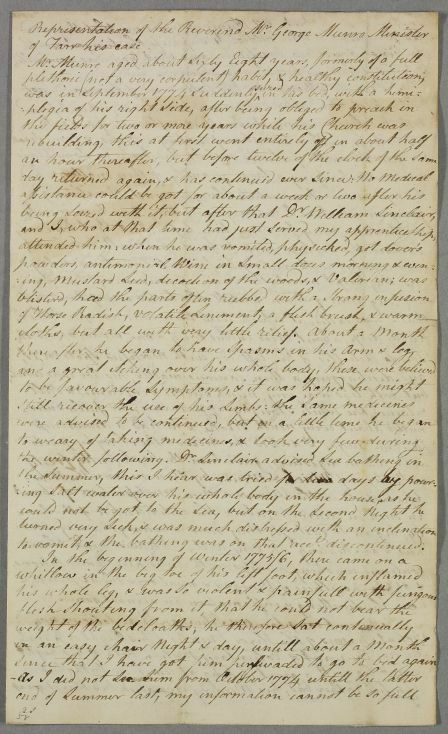 Letter from Harry Bruce, concerning the case of Reverend George Munro, minister of Farr, who has suffered various complications, including inflammations and swellings of his legs, since becoming hemiplegic in September 1774. At that time he was being treated by Dr William Sinclair and the author, who had just served his apprenticeship. Bruce notes that 'there is no electrifying machine to be got in this Country'. The letter is to be presented to Cullen by Lady Reay. 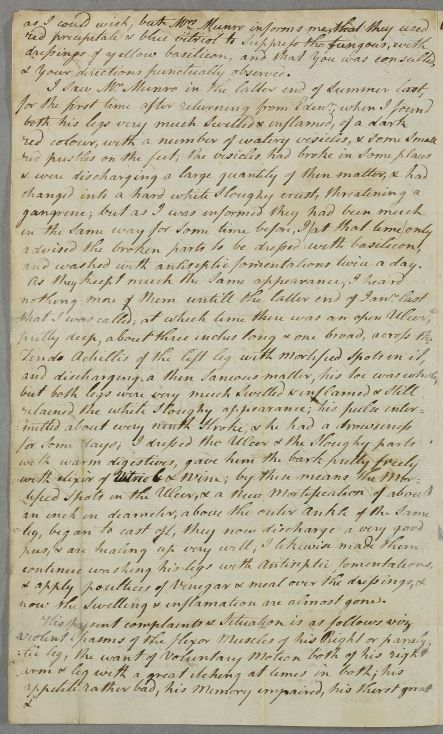 The author also asks Cullen if he would like to see his account of 'a petechial fever I had lately under my care, with some very bad symptoms; but which confirms some of your doctrines'. 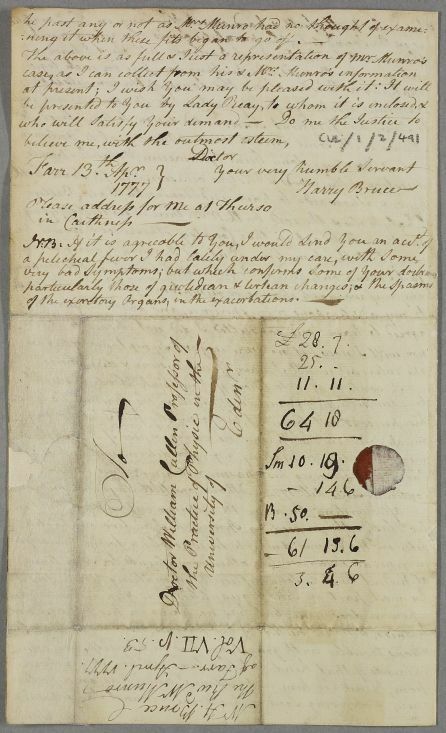 Summary Letter from Harry Bruce, concerning the case of Reverend George Munro, minister of Farr, who has suffered various complications, including inflammations and swellings of his legs, since becoming hemiplegic in September 1774. At that time he was being treated by Dr William Sinclair and the author, who had just served his apprenticeship. Bruce notes that 'there is no electrifying machine to be got in this Country'. The letter is to be presented to Cullen by Lady Reay. 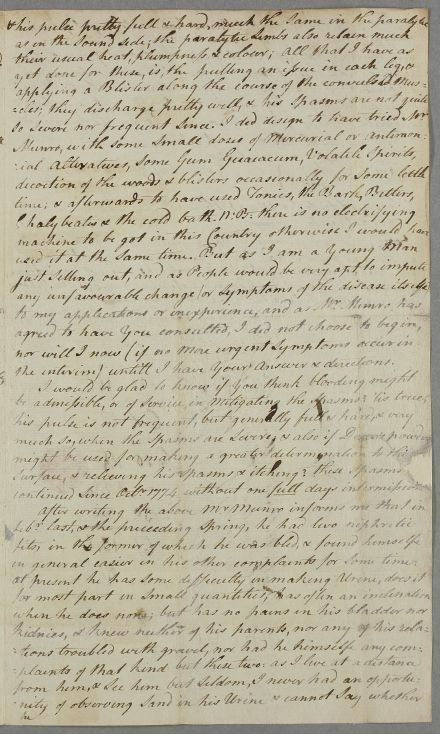 The author also asks Cullen if he would like to see his account of 'a petechial fever I had lately under my care, with some very bad symptoms; but which confirms some of your doctrines'. Case of Reverend George Munro with hemiplegia. Case of an unnamed patient with 'petechial fever'. to vomit, & the bathing was on that account discontinued. & your directions punctually observed. and washed with antiseptic fomentations twice a day. now the swelling & inflammation are almost gone. so severe nor frequent since I did design to have tried Mr.
the interim) untill I have your answer & directions. of Farr. -- April. 1777.
to vomit, & the bathing was on that acct. discontinued.